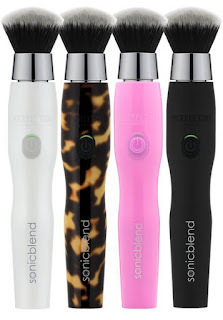 The Sonicblend is the first of its kind makeup brush that uses sonic technology to apply makeup. It is faster and more powerful than any other rotating makeup brushes, the Sonicblend applies makeup flawlessly at up to 400 micro-movements per second. This brush easily sweeps on foundation, blush, contour, highlight, setting powder and bronzer without lines or streaks for a natural looking airbrushed-like result every time. And, the Sonicblend comes with built in protection against microbial contamination so the brushes stay cleaner, fresher longer. It comes in four colors: white, tortoise shell, bright pink and black. Intended for comfort and control, the ergonomically designed Sonicblend uses gentle sonic movements to easily sweep on foundation without leaving lines or streaks. It is ideal for applying foundation, blush, contour, highlight, setting powder and bronzer. Effortlessly blends your favorite liquid or powder makeup in extra fine layers for natural looking airbrushed-like results every time. This brush creates better coverage too so you use less makeup. And, the Sonicblend can help improve the overall health and condition of your skin by minimizing clogged pores as well as irritation from rubbing and stretching the skin, which can occur with traditional makeup application. • An intuitive patent based technology that uses sonic movements to prevent clumping by dispersing individual granules of makeup into wrinkles, enlarged pores & fine lines for a 3D flawless makeup application. • Sonic bristle movements oscillate thousands of times per minute to ensure an airbrush-like finish. • Ideal for applying foundation as well as applying blush, contour, highlight, setting powder & bronzers for a seamless, perfectly blended makeup application that mirrors results of what professional makeup artists can achieve. above: box, brush with head, charger and instruction booklet. above: brush with head, charger and instruction booklet. I really like using the Sonicblend brush. I notice that makeup goes on so smoothly, it does look airbrushed. And other makeup such as highlighter and blush looks fabulous too. I have no concerns or comments to make on this product. It can be used a fairly long time before it needs to be charged again too. I have it in tortoise shell, which makes me feel fancy. It is very easy to use too, it does not go too fast nor too slow. It applies makeup perfectly. 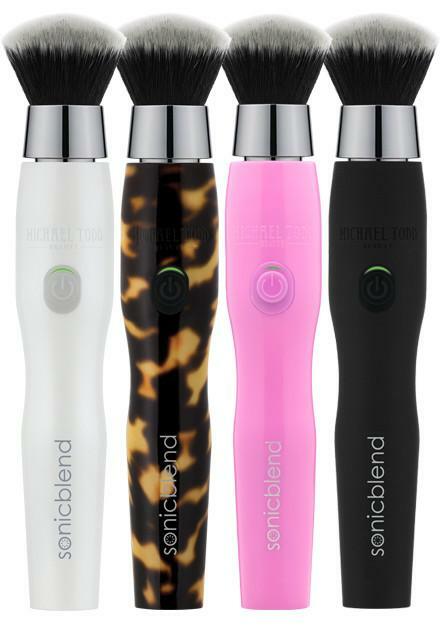 The Michael Todd Beauty Antimicrobial Sonicblend Makeup Brush retails for $79.00. It is available fromwww.michaeltoddbeauty.com. Like Michael Todd Beauty on Facebook:https://www.facebook.com/MichaelToddBeauty; Follow Michael Todd Beauty on Twitter: @MichaelToddBeau; Follow Michael Todd Beauty on Pinterest:https://www.pinterest.com/MichaelToddBeau; Follow Michael Todd Beauty on Instagram:https://www.instagram.com/michaeltoddbeauty/ and Subscribe to Michael Todd Beauty on YouTube:https://www.youtube.com/user/MichaelToddOrganics.